Yesterday, my Mom called to let me know that my grandmother had passed away last Sunday. It was to be expected. Grandma had been ill since last January and many in the family suspected she would not even make it till her birthday, which was end of February. She did, and reached the respectable age of 102 years! 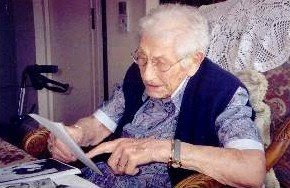 The picture below was taken when she turned 100 years of age. Things went downhill after Grandma's birthday. She deteriorated fast. She got cervical cancer and due to her age, the doctors didn't think it wise to do surgery. She got morphine for the pain and had to have astronaut food because she couldn't eat anymore. Physically, she got worse, but mentally she was very much up to date until the end. Praise The Lord! I know you will miss her. Am praying for your family. Yes she will be missed. I'll be keeping you and all your loved ones in my thoughts and prayers. Thanks so much, Lieve Zus! I am so sorry that you lost your Grandmother. We will be praying for comfort for you and your family. Corry, I am so sorry for your loss. I pray that the Lord will be near and dear to you during your time of sorrow. Corry, I'm so sorry about your Grandma. Thinking and praying for you and yours during this difficult time. (((HUGS))) and blessings to you. She will be missed , but thankfully you have good memories of her ! There is always those special little things that we all remember so well and miss! PS. - Give them 2 little rugrats a squeeze for me ! Thank you so much! I hope all is well with you. So true and I hope and pray she is happy now and no longer in pain. Will give the boys a squeeze from you. They will be all ours tonight, hehe. Have a very blessed day y'all. Please look after yourself, my friend. Corry and family, there is not a tear in heaven not one. But here on earth is so much different. I wish there were no tears here and no death but there is. I hope peace comes to you and yours and know that God Himself saw this and will and does comfort you. Be loved you are. Mourn you will be comforted. I read this post the other day about your grandmother and have been praying for you and your family ever since in your loss. It sounds like your grandmother was a dear woman who lived a life on this year many years past the time most of us die. For that you must be very thankful. May God continue to be with you all during this time of great sadness. So sorry for your loss! I'm sure you'll miss her! I read it at Kitty's blog! Isn't that exciting. I am so happy for her. I hope and pray you are doing better! Thank you so much. Yes, she will be missed.